Much as she has done in her documentaries, Cowperthwaite captures her subject(s) sincerely and honestly; such that it naturally diverges into other matters. 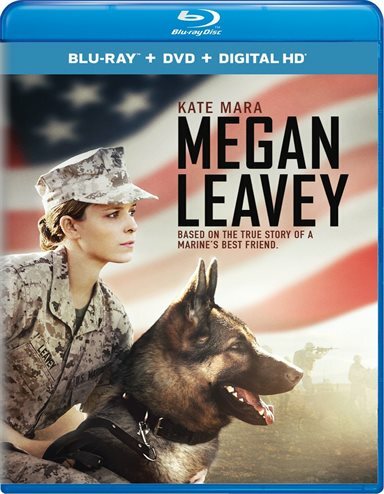 MEGAN LEAVEY is an innovative interpretation of what makes a hero; specifically, during wartime. A Bleeker Street Media film directed by Gabriela Cowperthwaite (Blackfish, City Lax: An Urban Lacrosse Story), it stars Kate Mara (House of Cards, Fantastic Four) as the young Marine Corporal. Inspired by the touching true life story of Megan Leavey and her military service dog, Rex, the screenplay is written by Pamela Gray and Annie Mumolo & Tim Lovestedt. For her debut dramatic narrative film, Cowperthwaite was unexpectedly sought out based on her storytelling experience and talent as a documentarian. Much as she has done in her documentaries, Cowperthwaite captures her subject(s) sincerely and honestly; such that it naturally diverges into other matters. She goes beyond the superficiality of the subject matter and shows the different layers that are (collectively) the story. In some ways, it can be a bit ambitious for a novice in the genre, but it is the openness of her approach that renders it a heartwarming tearjerker. Perhaps undervalued as an actress, Mara brings earnest commitment to the lead role even when dramatic liberties are taken with some of the story details. There is a complex naivete that is, perhaps, signature Kate Mara; and, it works in depicting the trajectory, and course of service, that puts Megan at risk of losing her life. In the film, Leavey is assigned to clean up the K-9 unit after a disciplinary hearing where she connects (and bonds) with an aggressive dog. In reality, she was assigned Rex upon arriving at Camp Pendleton after enrolling in the military police's K-9 unit. The film also portrays Leavey as escaping the trials of her life when, in fact, it was a conscious decision taken in the aftermath of September 11th. Regardless, in the film as in real life, Megan and Rex form a unique bond that saves numerous lives during their tours of duty in Iraq. They served their nation proudly (during two deployments) on the front lines searching out possible explosives in advance of the troops; until, ultimately, they are both injured after an IED explosion during a clearing mission. Upon her stateside return, Leavey works tirelessly through tremendous amounts of red tape to honor (& unite with) Rex in his retirement with some assistance from Senator Chuck Schumer. While the dialogue can sometimes feel too scripted, it can be overlooked given the spectacular (as expected) performances from Edie Falco (The Sopranos; Nurse Jackie) and Bradley Whitford (The West Wind, The Cabin in the Woods) as Megan's parents, Ellyn and Bill. The film also features performances by Ramón Rodríguez (Transformers: Revenge of the Fallen, The Defenders), and Common (Girls Trip, Selma). You can hear the crisp detail of music, explosive effects and background noise alike thanks to the DTS-HD Master Audio 5.1 lossless soundtrack. Download Megan Leavey from the iTunes Store in Digial HD. For more information about Megan Leavey visit the FlickDirect Movie Database.